Well, he's just about perfect. 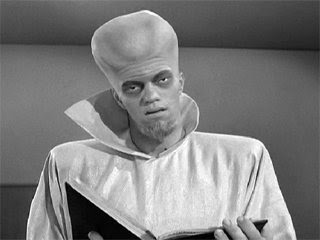 It's all here: The bulbous forehead, the deceptively docile expression, that mysterious (and, as it turns out, plot-twisting) book.... and then there's the base, which represents the Harryhausenesque flying saucer seen in the episode! With any bobblehead, you're not necessarily looking for accuracy (in terms of proportions or actor likeness). The character should be recognizable, and the sculpt should possess both charm and whimsy. On these fronts, Bif Bang Pow! 's Kanamit succeeds brilliantly. The Twilight Zone logo sits at the front of the saucer base. It's not that obvious in the above picture, but the logo appears to be springing forth from the base in 3D. A nice touch. The white paint is a bit sloppy, but nothing some black paint and a tiny brush can't fix in about thirty seconds. At this price point, it's a VERY minor quibble. The rest of the paint --- particularly on the face --- looks good. Hello, my pretty. You look good enough to eat...! The Bif Bang Pow! logo can be found on the underside of the base, along with the requisite copyright information. Oh and look, he's Made In China. A Chinese food joke seems appropriate, given the culinary aspect of the episode in question, but I'll hold my tongue. At 12.5 ounces, The Kanamit ties with The Mystic Seer as the lightest of the first 5 bobbleheads, but that doesn't make him (it?) a lightweight. A well-aimed throw would almost certainly result in a big bruise. ..and compare it with shot of the original prop. Or it could be replica, I dunno. With Google Images, you take your chances. Anyway --- we've got a match! The verdict? Bif Bang Pow! is four for four. 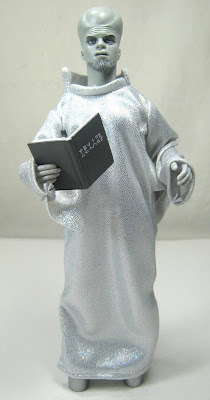 Their Kanamit bobblehead is an absolute knockout. They're kinda like the Pixar of the Twilight Zone merchandise realm.... they can do no wrong. Next: It turns out Tribbles aren't William Shatner's only furry nemesis. Before he ever stormed the galaxy as Captain Kirk, he ran into a rather ugly character on a fateful airplane flight. That character, commonly referred as The Gremlin, has arrived in bobblehead form. How did the little furball turn out? Stay tuned. 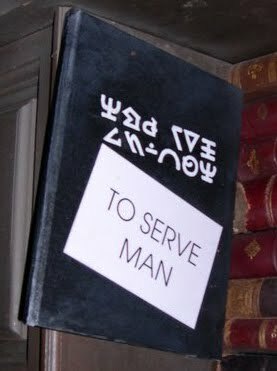 The Kanamit cookbook pictured above is actually a replica prop from one of The Twilight Zone Tower of Terror attractions ( a must for all TZ fans) at either Walt Disney World or Disneyland. Great blog! Do you own those bobble heads? Where did you purchase them? My dad and I are longtime Twilight Zone fans, and I'd love to get these for him as much as he'd love to own them!